Rhamnus Nakaharai is a herb that has been used as folk medicine in Taiwan for intestinal distress (mostly constipation) and asthma, it is a good source of Quercetin glycosides but not much research exists on the herb per se. Our evidence-based analysis on rhamnus nakaharai features 5 unique references to scientific papers. Rhamnus Nakaharai is a taiwanese medicine historically used for gastrointestinal ailments. It belongs to the Rhamnus species of plants of which variations are grown globally. Rhamnus Nakaharai is a source of various phytonutrients (plant based nutrients) particularly, it is a fairly good source of Quercetin. You are now following Rhamnus nakaharai. You will be notified when any significant update is made. Not enough information is known about Rhamnus Nakaharai to come to a conclusion on proper dosages. Rhamnus Nakaharia (from the family Rhamnaceae) is a folk medicine originating in Taiwan that has been used to treat constipation, inﬂammation, malignant tumors, and asthma. The compound 6-methoxyorigenin appears to have anti-oxidative effects in vitro, as well as the related compound Isotorachrysone, which share structural similarities. 6-methoxygenin outperformed Trolox (a research standard) on Metal-chelating and protecting from lipid peroxidation, and was slightly outperformed on a DPPH test. The IC50 of the metal chelating ability of 6-methoxyorigenin (615.90+/-5.79) was lesser than that of EDTA (127.92+/-6.27). 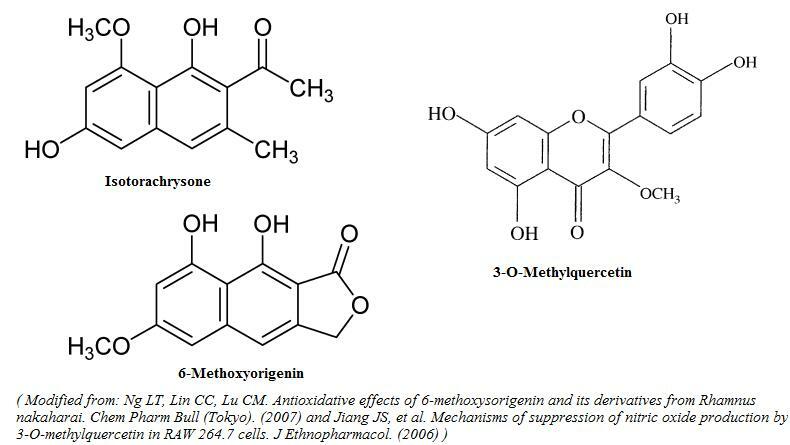 3-O-Methylquercetin has been found to suppress the inflammatory (Nitric Oxide mediated) response from LPS (research pro-inflammatory agent) in macrophages in vitro. 3-O-Methylquercetin was found to inhibit Nitric Oxide release, protein expression of iNOS (induced by inflammation) and mRNA translation of iNOS with IC50 values of 4.23uM, 4.36uM, and 6.53uM respectively. 3-O-Methylquercetin appears to be a selective PDE3 inhibitor with an IC50 of 1.6mM via competitive inhibition.